Meanwhile, heat a large non-stick skillet over medium-high heat. Add ground beef and sprinkle with chili powder, black pepper and salt. Cook about 6 minutes, stirring frequently, until meat is browned. Set aside. Spread salsa out evenly on top of the pre-baked crust. Top evenly with ground beef, and then shredded cheese. Return pizza to oven for 10-12 minutes, or until cheese is melted. Remove pizza from oven, and top with lettuce, avocado, green onions and cilantro. Drizzle with sour cream if desired. Serve immediately. I’m pretty sure that I could live on tacos. Or pizza. Or egg drop soup. (Ok ok, no soup in this recipe.) But when you combine tacos AND pizza, I’m definitely a happy camper! 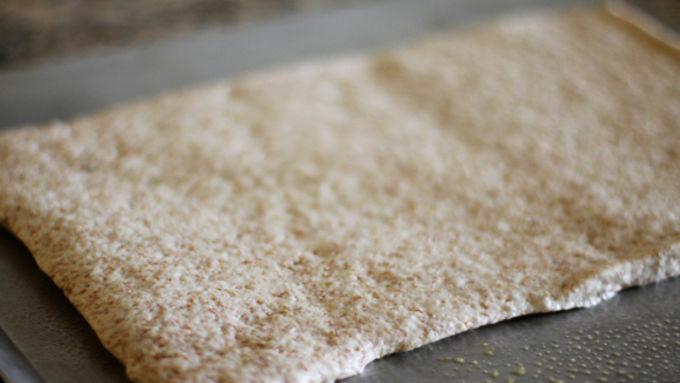 Especially when the pizza is loaded up with all sorts of delicious salsa, seasoned meat and my kind of “greens.” And, this recipe uses a fabulous whole grain pizza crust that brings it all together in minutes. If you’re not a hamburger person, feel free to substitute chicken or sausage instead. Or you can easily go vegetarian! 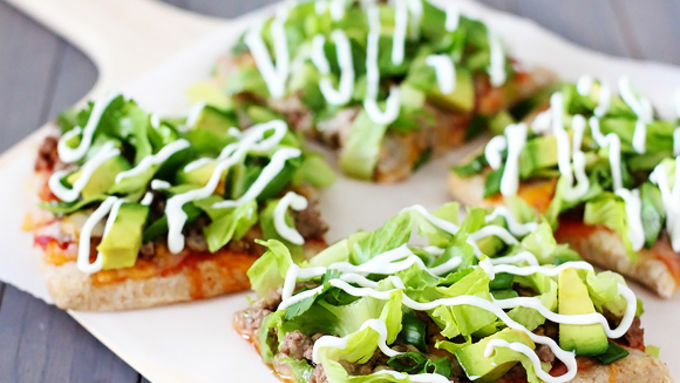 However you make it, I think you’ll love this simple Taco Pizza. 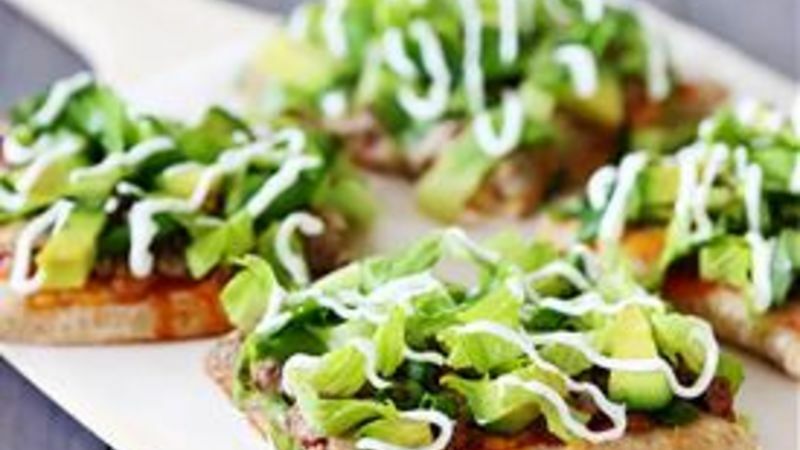 Layer on some “greens” – chopped lettuce, avocado, green onions and fresh cilantro. Pretty! Then drizzle with some sour cream if you’d like. (I just spooned some into a thick Ziplock bag, and snipped off the corner and drizzled away!) And then voila! 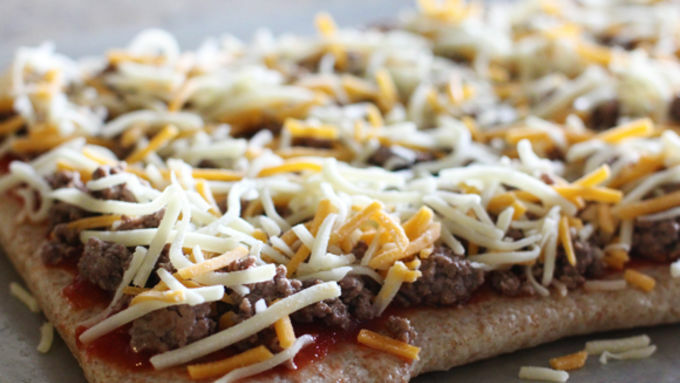 A delicious taco pizza is ready to go in minutes.